Empire Burlesque first came to my attention when Richard Hell wrote something on his web site about liking it. While the focus isn’t always on the lyrics — something almost guaranteed to turn off most Dylan fans — the musical backdrop is far richer than on most of his albums. It does sound a little dated. But the use of (synth) horns and backing singers works better here than on Street-Legal. There is a ragged decadence to the music that fits. It captures well the superficiality and banality of the Thatcher/Reagan era. The songs evidence contentment, but with questioning, lingering doubt just below the surface. Something about it all sounds mature. 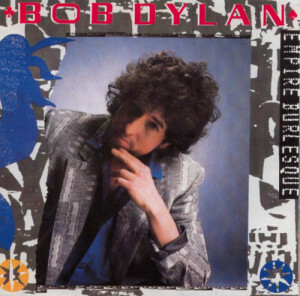 Plus, for the skeptics, try going straight to the solo acoustic closer “Dark Eyes.” Can you maybe admit that the young Dylan of the 1960s was still alive and well? If you can answer “yes” in the context of an overtly “folk” song, then go back to the opener “Tight Connection to My Heart (Has Anybody Seen My Love? )” and “Emotionally Yours” and ask if there isn’t some of the same spark there in a whole different setting. This album may be reviled by many fans, but it is probably my favorite of the post-Desire albums, edging out Shot of Love and Good As I Been to You. This might be his best of the 80s — yes even better than Oh Mercy.